Love Construction is a campaign that has been slowly developing since the 2 July launch of the UK Government’s latest construction strategy. Its origins lie in an editorial written by Construction News editor Rebecca Evans who argued that it was time for industry people to have their say in how the industry is perceived. The vision for 2025 painted in the government’s document is ambitious, but it won’t be delivered if current perceptions of the industry aren’t changed, and this isn’t about a slick marketing or PR campaign, it’s about the people already in the industry explaining why it’s a great place to work and develop a career. This challenge to the industry was picked up by a group of industry people who responded to Rebecca’s call and met in a cramped Construction News meeting room three days after the strategy launch. In little over an hour, we did a load of brainstorming, various commitments were made and the campaign began to roll. Four weeks later, we are beginning to see people (Mace’s head of BIM, David Philp, for example) and organisations (CITB, Wates, etc) endorsing the campaign. I sometimes tell people I joined the construction industry almost by accident, and IT was part of that ‘accident’. I was doing a PhD in criminology but needed work to fund my fieldwork and pay for essentials such as housing and food. I could use word-processing software, so I went to a temp agency; my first assignment was at consulting engineer Mott MacDonald and my second was at another consulting engineer, Halcrow. I ended up spending seven years at Halcrow, and, when I finished my PhD, I didn’t want to leave construction. I’d learned about marketing and found that I had writing and photographic skills that I could apply. 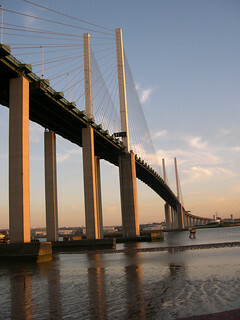 Before long, I was doing site visits, climbing up half-constructed bridges (the QE2 Bridge at Dartford and Second Severn Crossing stand out), photographing motorways, sewage treatment works and tunnelling projects (among many others) and writing about the people behind these projects. And while I was at Halcrow I also began to write about IT as the firm made its transition from manual drafting to computer-aided design (CAD). This interest in IT continued during four years with Tarmac Professional Services, where I first encountered 3D design tools and electronic document management systems (used by Schal on the redevelopment of the Royal Opera House; that tool was later taken on board by Cimage – today part of the history of McLaren Software). And when I went freelance in the late 1990s, I wrote numerous case studies about use of IT to support construction projects (including one for Cadweb). This led me to BIW Technologies and then my current business, where I remain actively involved in many aspects of construction IT (from SaaS collaboration to mobile, to BIM, to social media, to Wikipedia). computers were vanilla-coloured boxes in our offices – now we have more computing power in a pocket-sized smartphone. Adoption of IT will accelerate as the BIM revolution takes hold, transforming construction from its site-based craftsmen origins into a sophisticated and profitable form of advanced design and manufacture of built assets, with the UK among the world leaders in construction information technology. It will also provide great opportunities for young people who are often intuitive collaborators and users of software and devices – my son can collaborate remotely with friends to plan, design and construct tunnels and buildings in real time (he’s 12 and loves Minecraft!). This enthusiasm should be exploited; we should be cultivating Generation Y and Z’s innate collaborative and IT capabilities, not locking them into silos and knocking the creativity out of them. I love construction. It’s given me a great career, which I continue to enjoy. This is why I’ve written this blog post and this is why I’ve added a Love Construction logo to my websites. You should too. I have had a lifetime in the industry and Love Construction. I believe like you that the industry is about people working together to create wonderful buildings. IT is a tool which may help to facilitate this but it is human contact that will be the key. We as an industry have to learn to manage our collaborative relationships in order to use the IT which is available. As you say, IT is only a facilitator – people collaborate, not systems – and the industry is still learning how to encourage collaboration instead of perpetuating more conventional adversarial attitudes. I remain hopeful that BIM will be part of the solution, but – again – it won’t be BIM technology per se, but BIM processes and people adopting a BIM-oriented mindset that will make the difference.